Last minute Easter decor with a simple three legged, small wooden stool from the thrift shop. 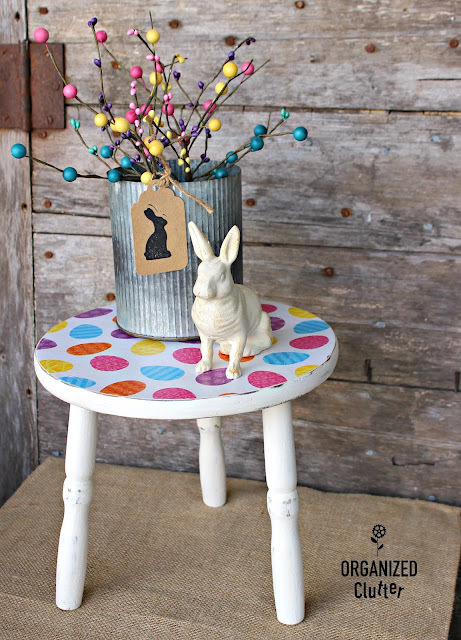 First I painted the little stool with Dutch Boy Chalky Paint in Antiquated Lace from Menards. I recently tried my first project with napkin decoupage after getting tips from Sweet Pickins blog and Salvaged Inspirations blog. 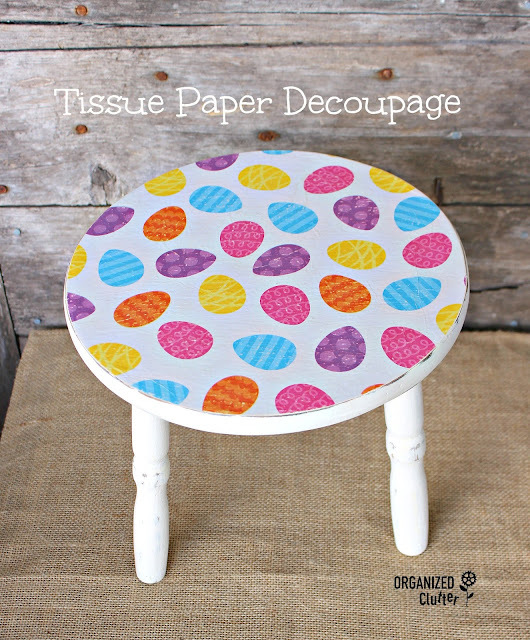 The stool project is being decoupaged with Easter egg print tissue paper that I picked up from Hobby Lobby. I thinned my Mod Podge down with water like the above blogger suggested. This is a good tip and smoothing the paper down with a sheet of cling wrap is as well. There is less chance of tearing the tissue paper. I used Mod Podge Waterbase Sealer, Glue and Finish (8-Ounce), CS11301 Matte Finish thinned to about 2/3 glue 1/3 water, and mixed it on a plate and applied it to the stool with a sponge brush. After the Mod Podge was dry I lightly sanded the edges of the stool to remove the excess paper, and very lightly on the tissue paper. I coated the stool and tissue paper top with one coat of Varathane 262075 Half Pint Clear Matte Finish Soft Touch Polyurethane . After one coat of water based poly, I lightly sanded the tissue paper design again. With one coat of poly, the paper has some protection from tearing and also color bleeding. I then brushed on one more coat of the Varathane poly. I love water based poly. Easy soap and water clean up, and no yellowing. Here is my finished stool! 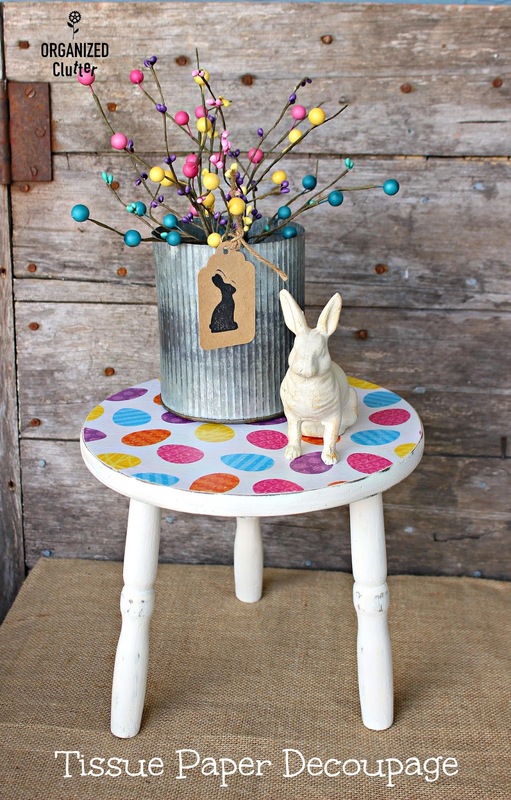 I added a cute and rustic Cast Iron Bunny Rabbit - Sturdy Easter Figurine Paperweight Door Stopper Home Decor and a Norah Zinc Vase with two colorful spring floral picks. The Medium Zinc Container or Norah Vases come in many different sizes. Both items can be used over and over again in your decor. What a bright and cheerful addition for Easter! A very sweet display! Love the stool makeover. Just adorable. I've a few things to decoupage so thanks for the blog sites. Enjoy a wonderful SUN SHINING weekend. Carlene, You did a great job on this stool. The Easter egg print turned out beautifully. Thanks for all the tips you included - I will remember to use some plastic wrap to help smooth the paper. 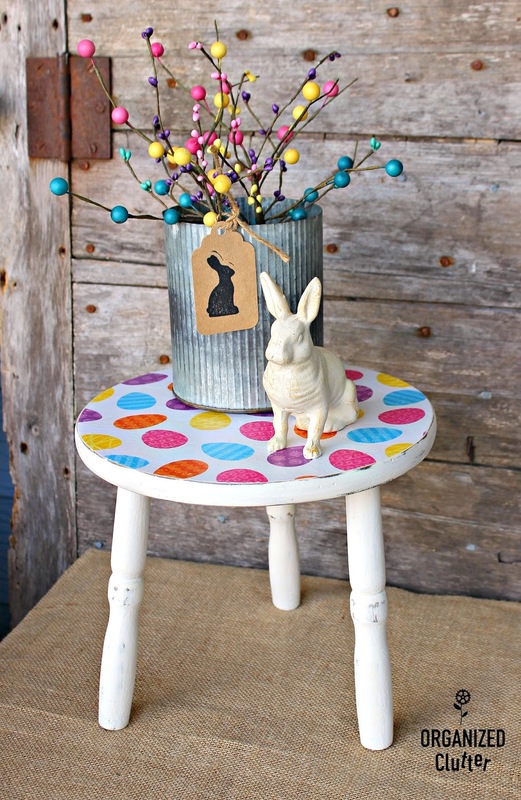 Love it, and the vignette you set up with the stool and bunnies.